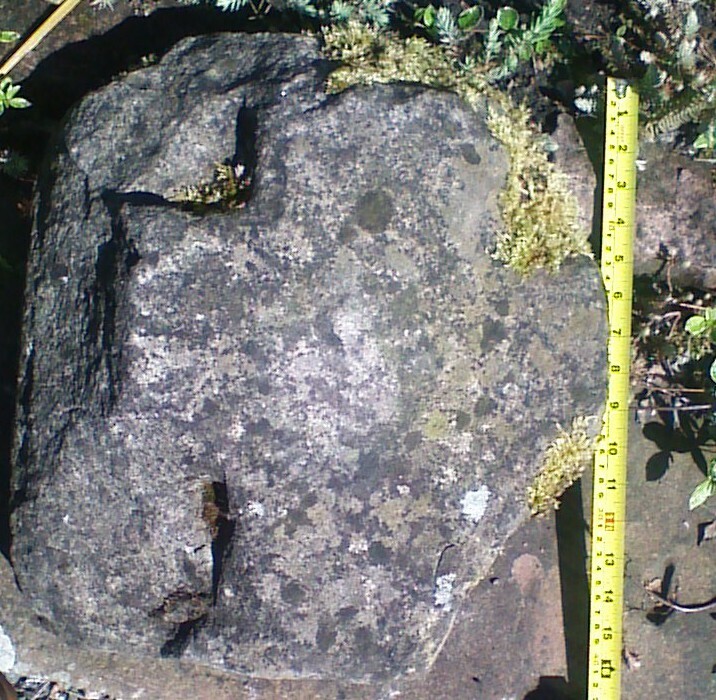 This intriguing carved, reworked and relatively portable piece of sandstone (0.32 x 0.38 x 0.15m) was originally located in a rockery in the garden of 1 High Street, Rosemarkie. Neither the owners of the house nor the local community have any knowledge of its provenance. The find location at 1 High Street is at the south west top of the High Street close to Rosemarkie Church and ancient graveyard where many Pictish and medieval stones have been discovered. The owners were selling their house and offered it to me as I was intrigued with its most unusual design. The front of the stone appears to bear the design of a cross carved in relief and the rear is flat. It may have originally been rectangular (possibly square or close to it) with a broad chamfered margin on at least three sides. The very prominent chamfer could be a feature of a cross slab associated with the early medieval Pictish centre at Rosemarkie but could equally point to being an architectural fragment with a later date. The fact that the chamfer has been partly removed and an arc cut out of the stone shows that the stone has been perhaps reworked and re-used for another purpose. This entry was posted in Black Isle, General Archaeology, Medieval, Pictish and tagged archaeology highlands, archaeology Scotland, cross slab, Cross stone, early christianity, highland archaeology, incised stone, Menmuir, North of Scotland Archaeological Society, NOSAS, Pictish, pictish symbol stone, picts, RCAHMS, recording and surveying, reworked pictish stone, Rosemarkie, Scottish archaeology, St Vigeans on January 18, 2015 by nosas.